Jaeger-LeCoultre created a collection that displays the incredible skills of the artists and watchmakers of La Grande Maison. Called Hybris Artistica, this collection is comprised of twelve complicated watches with specially crafted cases where design, technical construction, watchmaking art and exquisite craftsmanship are blended together to achieve pure horological excellence. With its flying Gyrotourbillon and its spherical balance-spring, the Master Grande Tradition Gyrotourbillon 3 made sensation in 2013, when it was unveiled. For the Hybris Artistica collection, this high performance timepiece is presented with a tantalum case, extremely resistant to corrosion but very challenging to work. The deep anthracite grey colour of the case, with bluish glows, is combined to the black dial for the hours and minutes, the anthracite dial of the chronograph counter, and the ruthenium-treated movement. The Master Grande Tradition Tourbillon Céleste features an orbital flying tourbillon which instead of indicating the passage of civil time, takes into account sidereal time, which is nearly four minutes shorter in duration than solar time. The dial is made of royal blue aventurine. 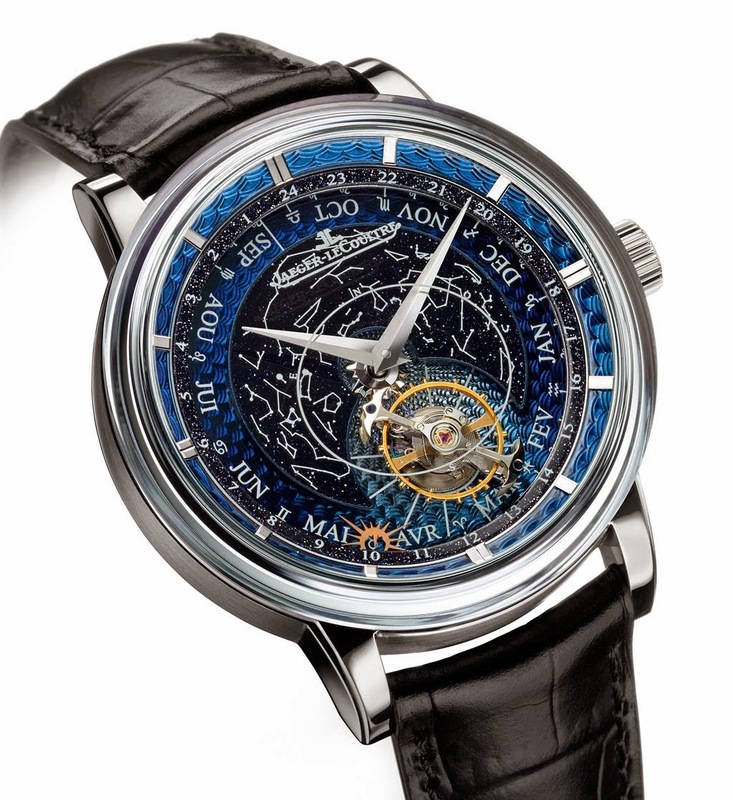 The area of the dial representing the months is guilloché and covered in translucent lacquer which recreates the effect of the depth of the cosmos. The inner bezel ring is also guilloché and filled with lacquer. First introduced in 2004, the Gyrotourbillon 1 features an incredibly light spherical tourbillon together with a perpetual calendar, a power reserve of 8 days and the running solar time (or equation of time). The dial of the special version created for the Hybris Artistica collection is made from a completely skeletonised aventurine plate, retaining in the end only openwork stone encrusted with sparkling flecks. The thick domed sapphire crystal, polished on the inside, is attached directly to the case without a bezel. Unveiled in 2009, the Duomètre à Grande Sonnerie strikes the hours with a complete Westminster carillon that chimes the longest rendition of the Big Ben melody ever played by a striking watch.In addition, this unique timepiece also features a flying tourbillon and a perpetual calendar with retrograde hands. The Hybris Artistica version showcases these exceptional complication thanks to a dial made of rock crystal. The structure of rock crystal, which is not amorphous like that of glass, interacts with the light to give a unique and intangible colour to a solid matter. With the Duomètre, Jaeger-LeCoultre introduced the innovative Dual Wing concept: two standalone movements, each with its own energy source but sharing a common regulating organ. As if it was not enough, this Duomètre model added a Sphérotourbillon, in which an additional axis of rotation provides a three-dimensional rotation of the tourbillon. Thes Hybris Artistica version of the Duomètre Sphérotourbillon provides an enchanting view of the amazing mechanics. The nearly transparent case showcases the dial, chiseled using a hand engraving technique that consists of removing material – here white gold – with a special chisel using multidirectional strokes to obtain a finely grained and glossy surface. The Duomètre Sphérotourbillon Enamel created for the Hybris Artistica collection has a precious dial made of blue paillonné enamel. The bezel is also decorated with a border of enamel in an elegant reiteration of the overall harmony. The side of the case is engraved with a design inspired by the Doge's Palace in Venice. Openings are pierced all around the case, then filled with enamel and polished, to reveal the beauty of the design. The Duomètre Sphérotourbillon pocket watch was inspired by a masterfully crafted timepiece, a grand complication pocket watch from 1928. It reproduces the graphic codes of the original, as well as the blend of enamel and white gold, heir to a long historical tradition. 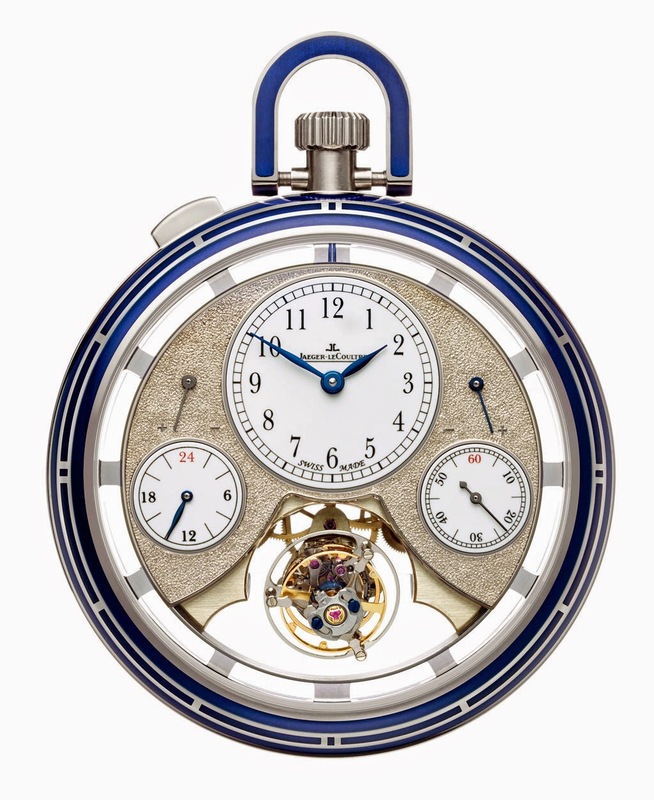 For the first time, a Sphérotourbillon was included in a pocket watch. 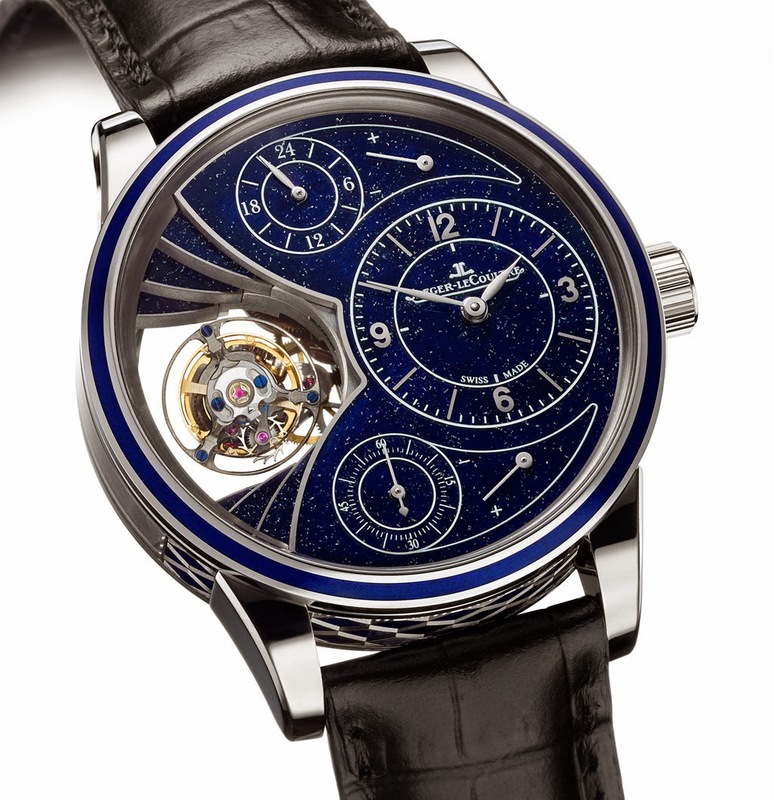 The transparent tourbillon bridge made of sapphire makes the spherotourbillon seem suspended in the air. This spectacular Reverso is entirely open worked, with hand-decorated plate and bridges. 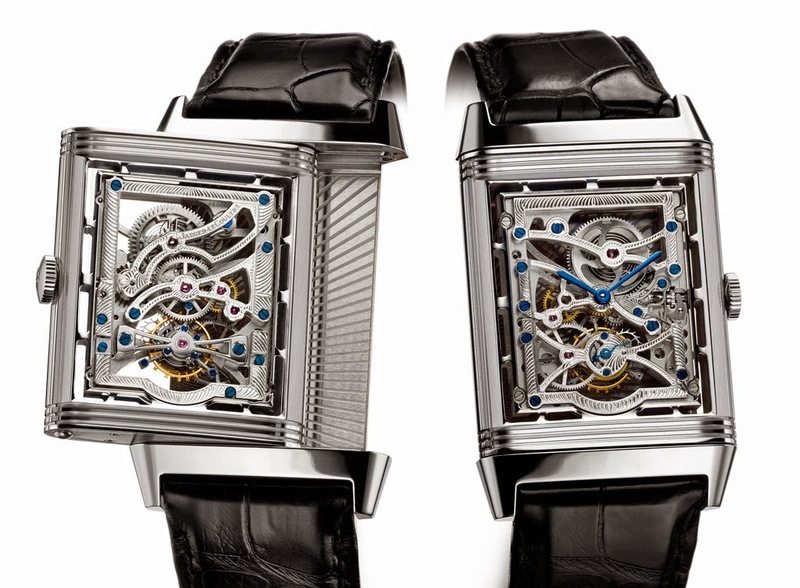 The pivoting part of the case consists of two sapphire crystal tiles while the skeletonised tourbillon movement, nestled in a metal frame, seems to float inside the reversible case. The Reverso Cordonnet Neva reinterprets a Reverso model from the 1930s in which the strap was a leather cord. The artisans of the Manufacture used the snow setting technique invented by the Manufacture to reproduce the same effect. Hundreds of diamonds of varying diameters are placed side by side to smoothly carpet the surface of gold. 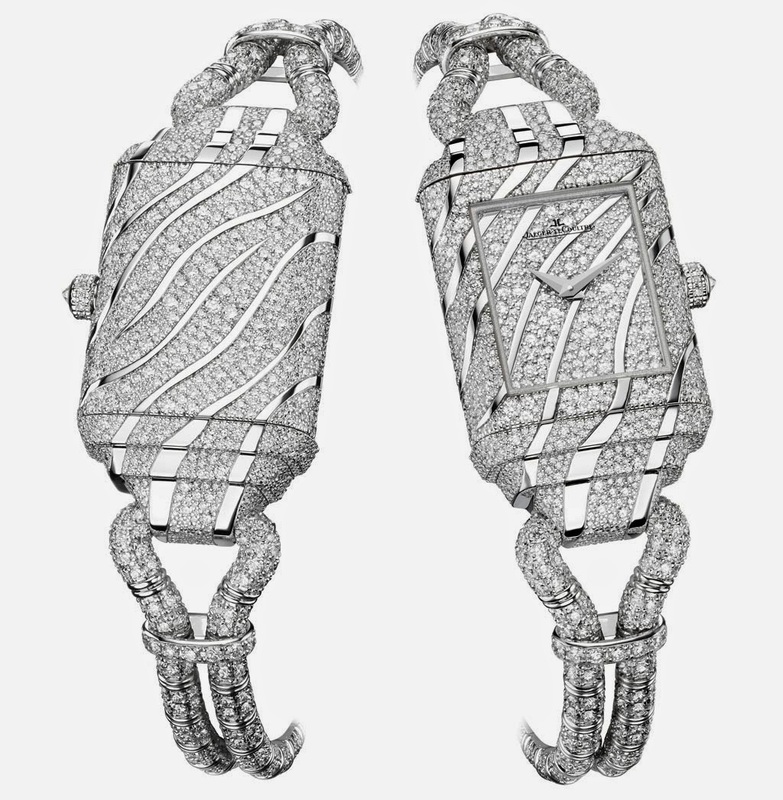 The diamonds are pressed together and blocked in place by the last stone set, with no claws to spoil the pleasure of touch. 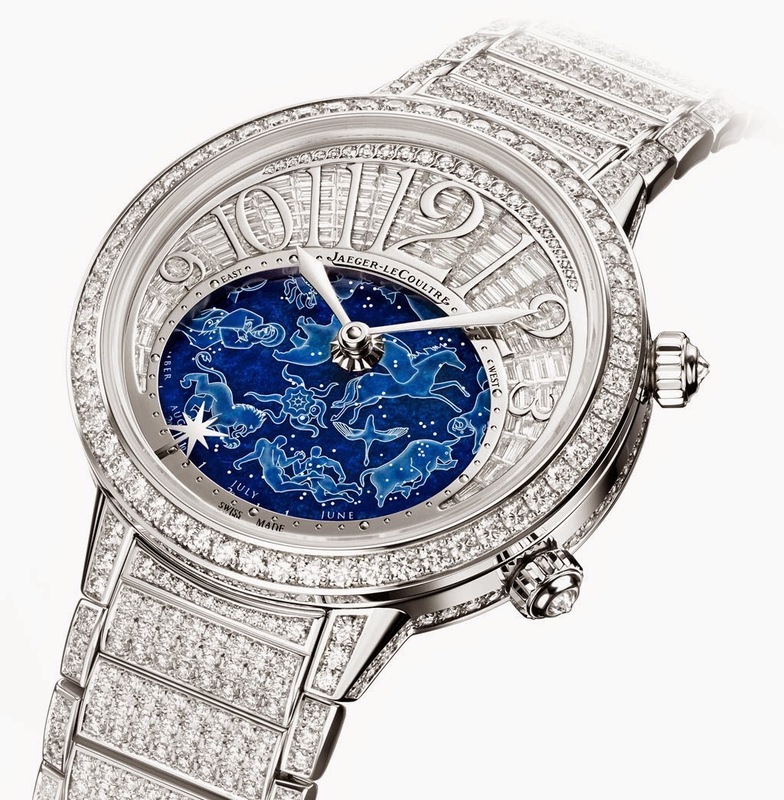 Introduced in 2013, the Rendez-Vous Célestial is a tribute to the founder of the Grande Maison, Antoine LeCoultre, an inventor of great genius with a great passion for the Milky Way constellations. 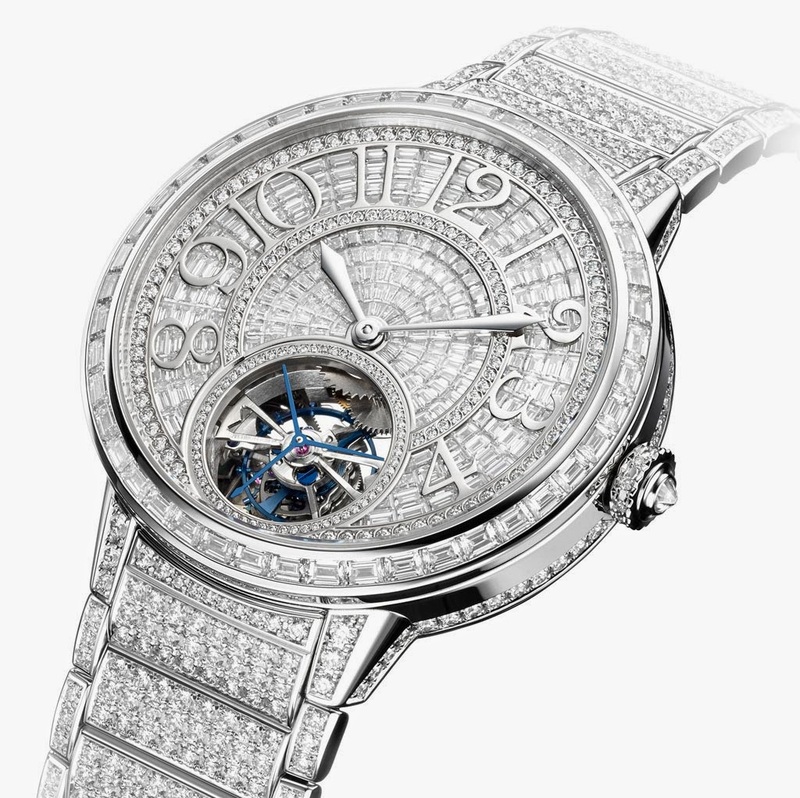 For its Hybris Artistica version, the upper dial of the watch is fully paved with baguette diamonds using the Rock-Setting technique, characterised by the absence of visible metal between the stones. It forms a luminous aura around the oval opening which houses a disc made of lapis lazuli displaying a chart of the sky. The dial of the Rendez-Vous Tourbillon created for the Hybris Artistica alternates baguettes-cut and round diamonds using the same Rock-Setting technique used for the Rendez-Vous Celestial. The bracelet is not less breathtaking. This Haute Joaillerie timepiece is enriched by a precious tourbillon at 6 o'clock. The Atmos clock draws its energy solely from variations in temperature. The slightest degree Celsius gives it a power reserve of 48 hours. 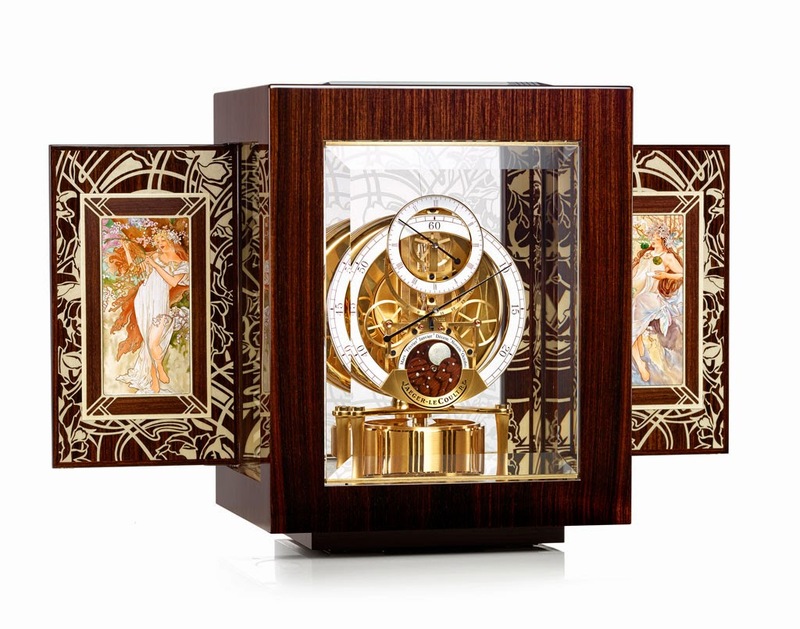 This virtually perpetual movement is here enclosed within crystal glass whose back is engraved with the same patterns as the wooden doors, which are crafted from Indian rosewood and horse chestnut and feature splendid handmade marquetry. The moon phase disk is also made of rosewood. To find more, visit the virtual museum of the Jaeger-LeCoultre Hybris Artistica collection. Jaeger-LeCoultre created a collections that displays the incredible skills of the artists and watchmakers of La Grande Maison. Called Hybris Artistica, this collections is comprised of twelve complicated watches with specially crafted cases where design, technical construction, watchmaking art and exquisite craftsmanship are blended together to achieve pure horological excellence. 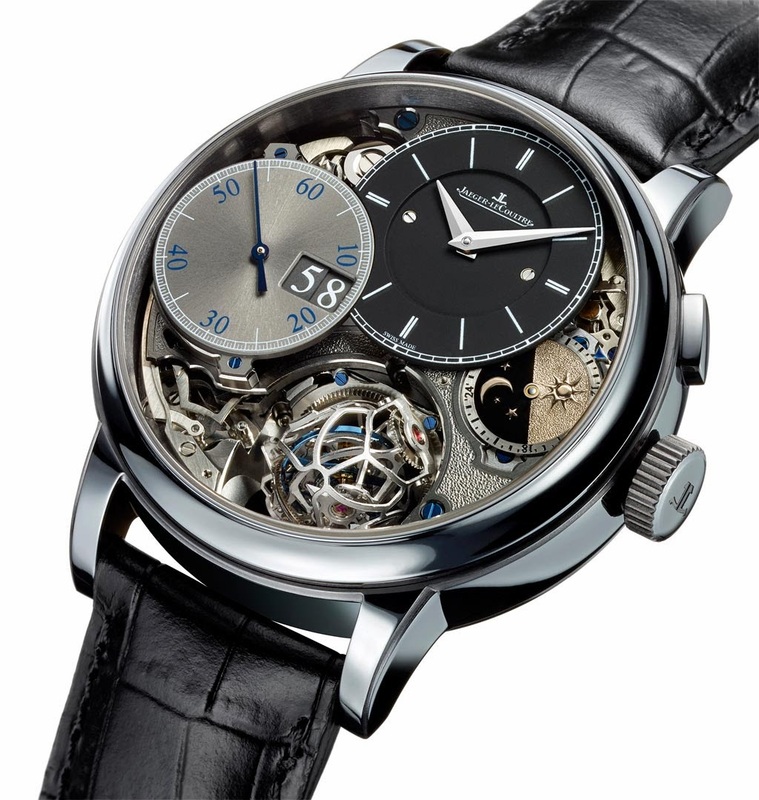 Master Grande Tradition Gyrotourbillon 3. 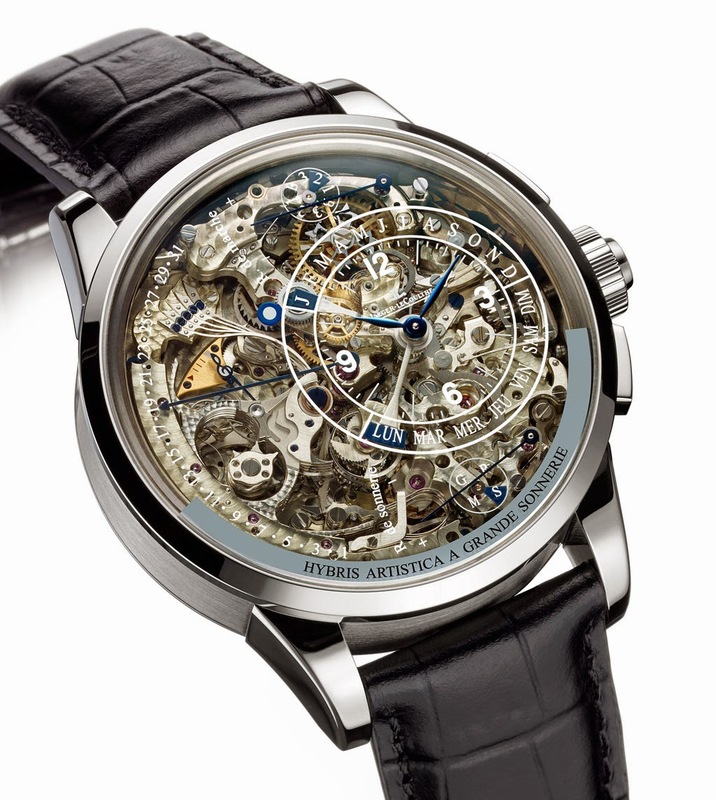 Master Grande Tradition Tourbillon Céleste. Master Gyrotourbillon 1. Duomètre à Grande Sonnerie. Duomètre Sphérotourbillon. 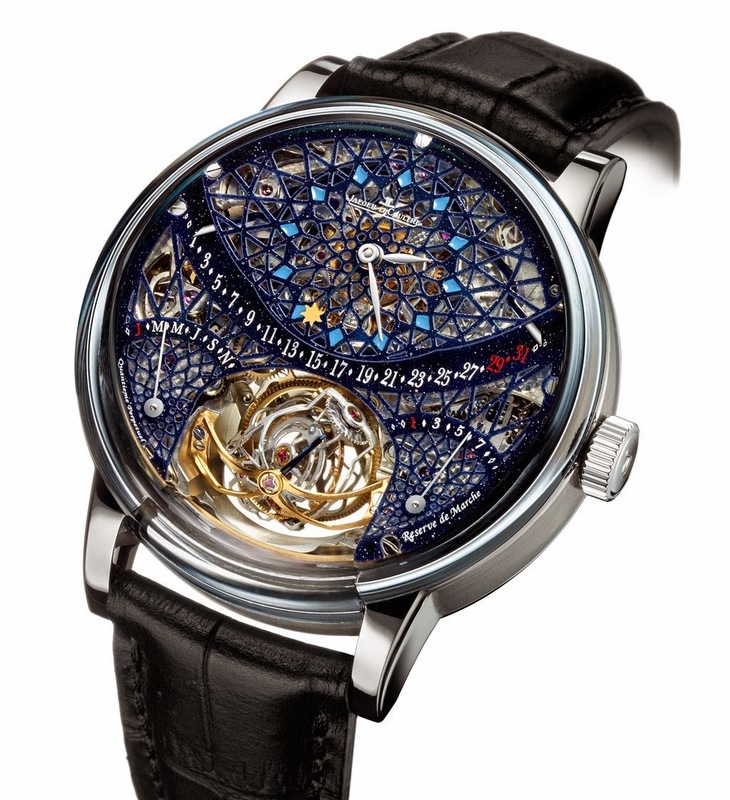 Duomètre Sphérotourbillon Enamel. 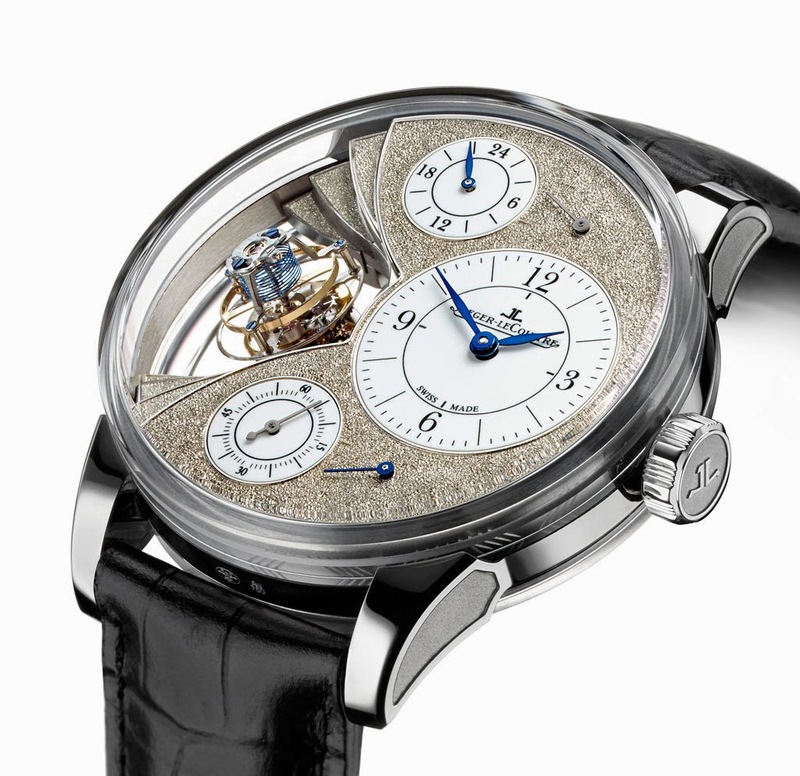 Grande Reverso Tourbillon Squelette.